The promotion of the rule of law has become an increasingly important element of peacekeeping and peacebuilding operations, particularly in Africa, where there have been numerous internal armed conflicts and missions over the last decade. This book explores the expanding international efforts to promote rule of law in countries emerging from violent conflict. 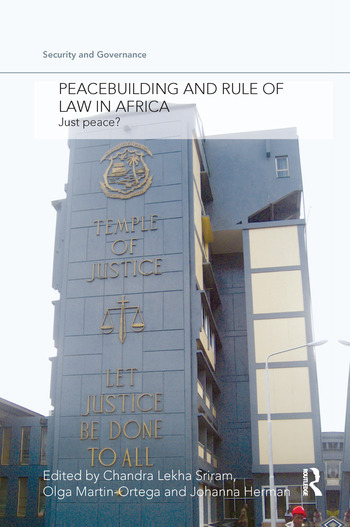 With a focus on Africa, the authors critically examines the impact of these activities in relation to liberal peacebuilding, rule of law institutions, and the range of non-state providers of justice and security. They also assess the virtues and limitations of rule of law reform efforts, and policy alternatives. It brings together expert scholars and practioners from politics, law, anthropology and conflict studies, and features detailed case studies on Rwanda, Liberia, Sierra Leone, Sudan, and the Democratic Republic of Congo. Making an important contribution to debates about peacebuilding, and assisting specific efforts in reforming the rule of law after conflict, this book will be of interest to students and scholars of international relations, law, African politics, post-conflict reconstruction, peace and conflict studies, as well as practitioners in the UN, development agencies and NGOs. Chandra Lekha Sriram is Professor of Human Rights in the School of Law, at the University of East London. Olga Martin-Ortega is Senior Research Fellow at the Centre on Human Rights in Conflict at the University of East London. Johanna Herman is Research Fellow at the Centre on Human Rights in Conflict at the University of East London.